We live in a society where living a green lifestyle is extremely important. Living an eco-friendly lifestyle means that you care about lowering your carbon footprint, and are taking steps to reduce, reuse and recycle responsibly. Environmentally friendly is the sum of everything you do on a daily basis. By using resources wisely; we can reduce waste in an efficient manner. You do not have to change everything at once; instead you should ease yourself into making small gradual changes that will be helpful and beneficial to the environment. The simple act of recycling plays an important role in the reduction of waste. Start off by recycling plastics, metal, glass and paper. These efforts will go a long way towards reducing waste. Being consistent with these efforts will produce less non biodegradable products in our landfills. It will also reduce the pollution that is generated. 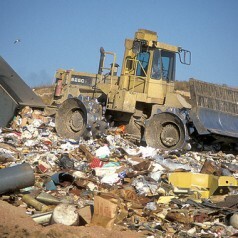 The more that is placed into the landfills, the bigger the problem gets. There are other ways you can eliminate waste if a plan is implemented of how to use alternative energy sources. Living a low impact lifestyle means that we take responsibility in our buying and waste reductions. By learning what can be done, we can bring a positive change through a collective effort. It is not just about what you buy, but the ways at which you dispose of it. *Save paper by paying your bills online and utilizing paperless billing. *Buy in Bulk to save on the amount of packaging that is used. *Use a compost bin at your home for garden and food waste to reduce the amount of waste that goes to landfills. *Conserve water usages by taking shorter showers, fixing leaks and installing low flow shower heads. *Drive less to save gas and money. Choose to ride a bicycle or walk at least twice a week. There are many ways to reduce food waste. On a daily basis, millions of pounds of food are wasted both domestically and commercially. If you monitor the amount of food that is discarded weekly from your refrigerator, the reality of what a wasteful society we are will come into full view. Wasted food translates into wasted water, energy and chemicals used to package and transport these products. *Prioritize the food in your refrigerator by moving older leftover food to the front so it will be eaten first. *Properly store food by keeping your settings between 35-38 degrees, thus extending the life of your food. *Convert over ripened fruits and vegetables into soups, juices, and jams. *Avoid grocery shopping when you are hungry. You’ll tend to overspend, thus producing waste. You may not be able to eat all of the food before it expires or spoils. *Cook food in large batches. Freeze food for use at a later time. Living a greener lifestyle is less about telling you what to do and more about helping people understand what we can do to reuse, reduce and recycle more responsibly. Derek has been living a green lifestyle for the past 5 years. He enjoys recycling and learning new ways to reduce waste and reuse material. He is currently blogging for a New Jersey dumpster rental company that has the same vision as himself, a cleaner world.